Exposures, at ExposuresOnline.com, helps you celebrate and preserve your memories. Exposures carries photo albums and scrapbooks with archival quality pages, picture frames, photo cards, and photo storage boxes. Look through Exposures’ collection of jewelry, novelty items, gifts, decor, stationery, and more. Exposures is a great way to look back on cherished memories, and appreciate them in the present. Make sure you check RetailSteal.com for Exposures coupons, Exposures promotions, and Exposures discounts. Exposures ships anywhere in the US, US territories, Canada and to APO/FPO addresses, for as low as $6.99. Returns must be made within 45 days of purchase. Check website for full details, exclusions may apply. 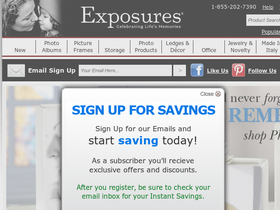 Shop at Exposures and enjoy a 30% discount with this coupon code. Act now and enjoy up to 40% off your order with this coupon code from Exposures.com. Check out the clearance and overstock section at Exposures and save up to 75%. Click link now. Shop at Exposures and enjoy 25% savings on your order. Click here for code. Get 15% off + free shipping on orders over $75 when you sign up for the email newsletter at Exposures.